Summon your inner tree hugger. 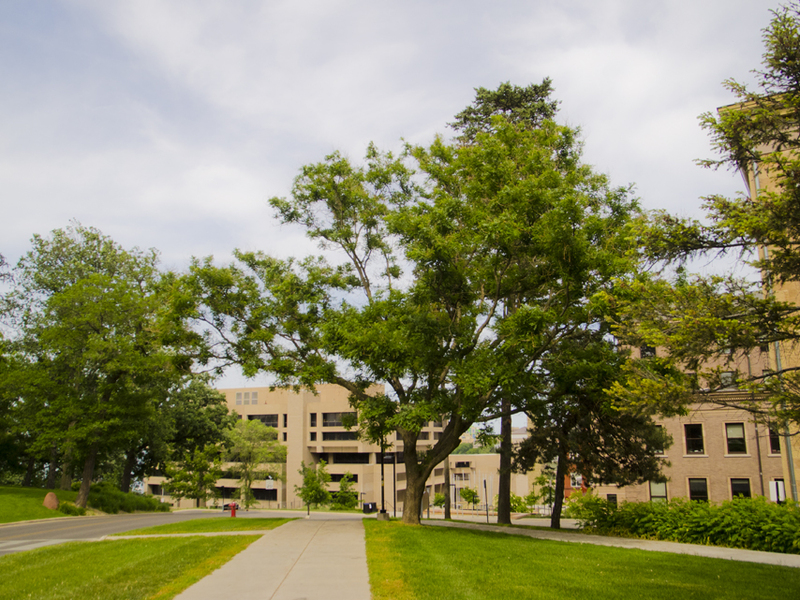 This is part 1 of a 3 part post covering the trees of the University of Wisconsin Campus. These trees were planted a long time ago, and now they are fully mature. 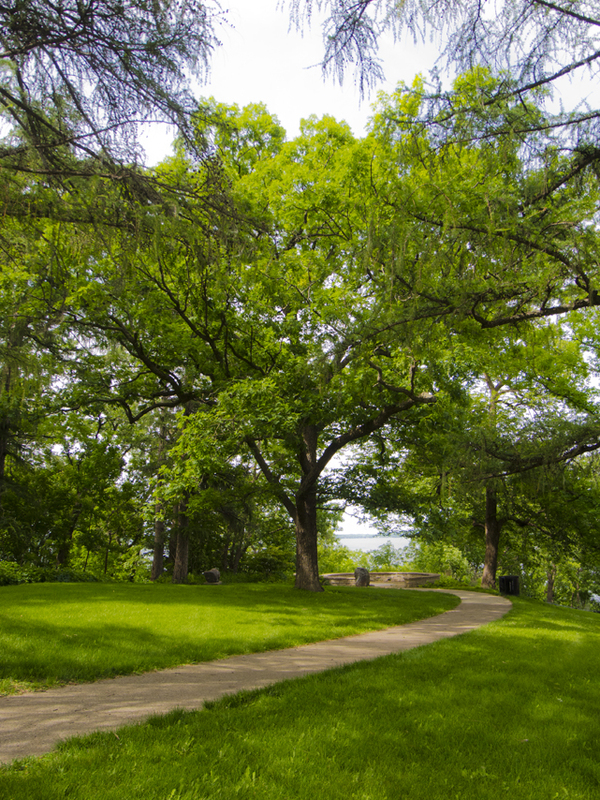 Many of them are Wisconsin State Champion Trees, a title bestowed on the largest representative of its species. 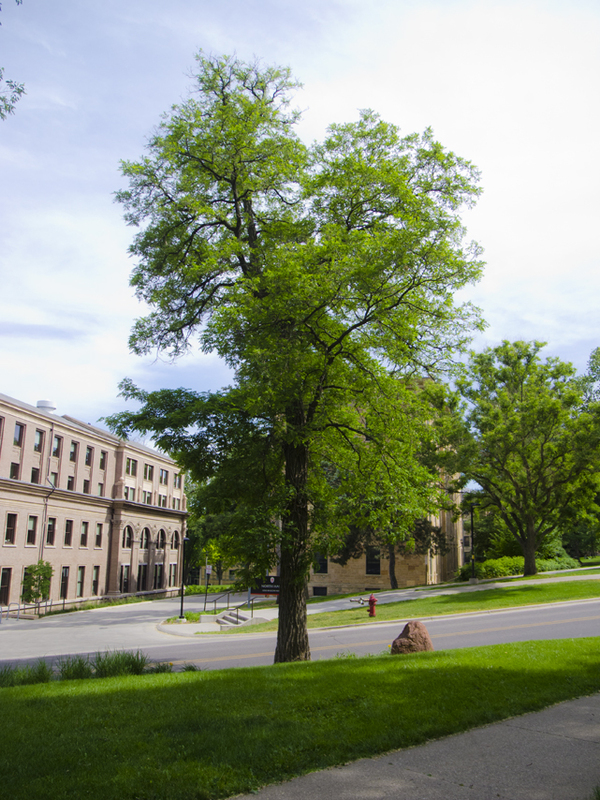 In 1925 the first pamphlet about the UW campus trees was assembled by Charles E Brown. Then, in 1998 for the Wisconsin Sesquicentennial, The University released a pamphlet with maps for two tree walks. 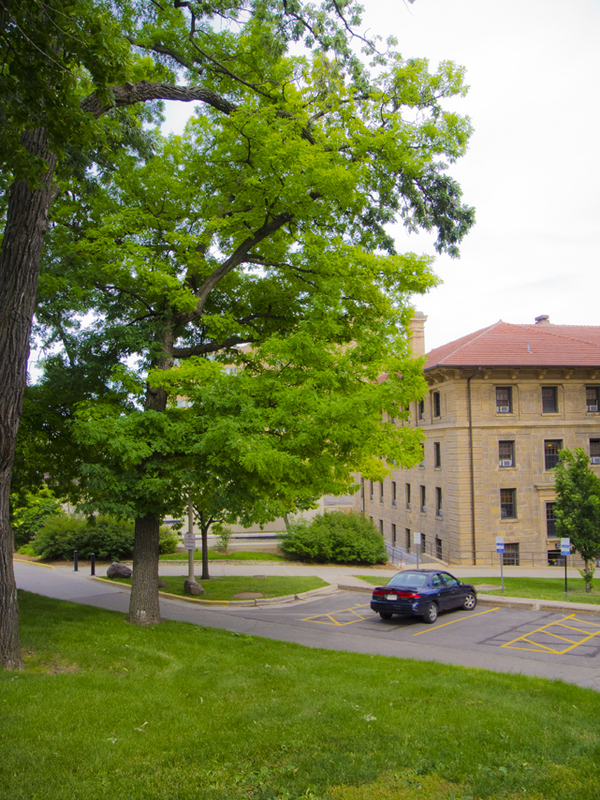 The first of those walks, the trees of Bascom Hill, is repeated here. These pamphlets are hard to come by today. The State Historical Society has a copy which you can browse in their reading room only. The call number is 08-1126, ask circulation to fetch it for you. My version will differ somewhat from the 1998 tree walk. Some of the trees have been cleared to make way for facilities improvements ... and there are a few additions I have made. Across cultures divided by space and time legends and lore of trees include the common belief that trees are inhabited by powerful spirits. This demonstrates the immediate importance of trees on local cultures. 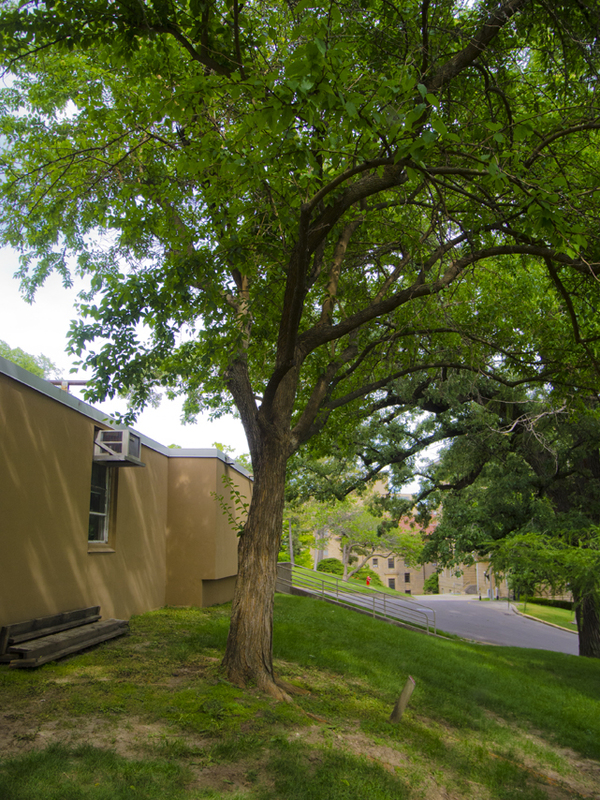 Trees provide shelter and shade, food, heat in the form of wood for fires, and building materials. They also seem to have personalities. If you were to be reincarnated as a tree, what tree might you be? A weeping willow? - emo; A poisonwood? doesn't play nice with others? A pine? - softwood ... but smells very nice; An oak? -a powerful warrior-like sentinel; An apple tree? intelligent and scholarly. 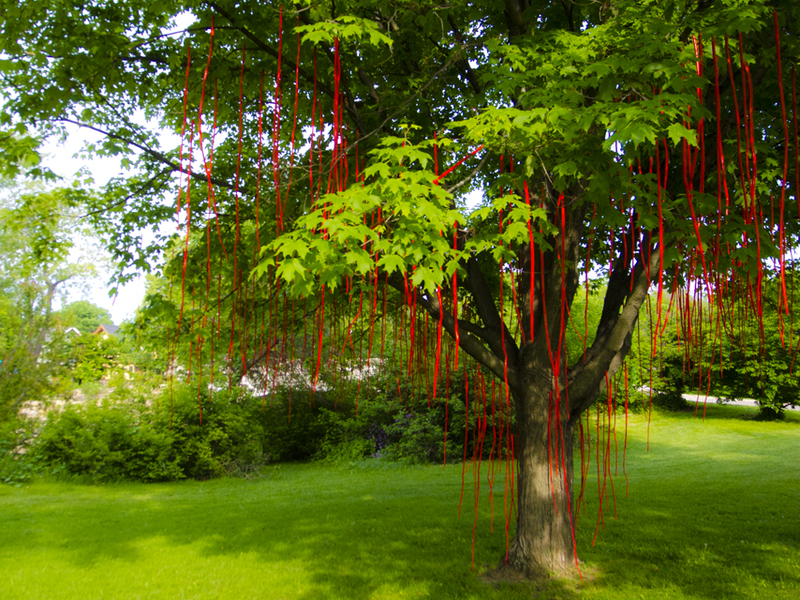 In Europe sacred trees were often decorated with ribbons tied to lower branches. In trees that possessed a hollow, offerings of coins and buttons were placed inside. Sometimes great warriors were buried beneath a tree so that their spirit could be taken into the tree, making the tree a guardian against evil. American Indians believed in the spirits of trees and offered tobacco by burning it in their fires. A tree is a common symbol of life, being planted for occasions such as the birth of the child, the death of a parent, on a wedding day, or on the first day of moving into a new home. 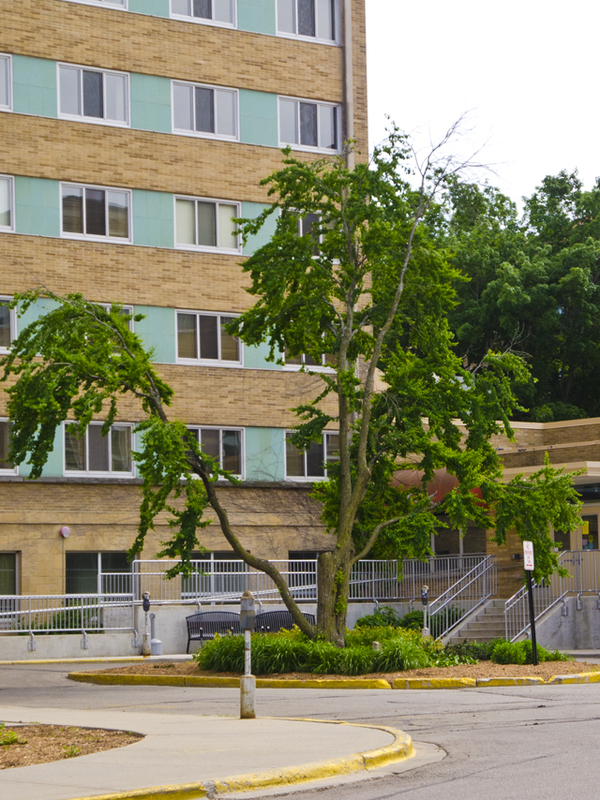 The tree pictured here is located on the Yahara River Parkway near Rutledge St. It was part of a 2014 public art display by Thomas Ferrella. Trees have long been an icon and symbol of knowledge. For every question that is answered two more questions arise. Thus, scholarly inquisition, or just curiosity, can be seen to branch out like a tree. Sometimes we are trying to get to the root of the problem; the lowest common denominator or the source which cannot be divided further. The pith of a branch is the central cylinder or core of a branch. When we try to get to the pith of something we are in search of the internal essence of a thing. 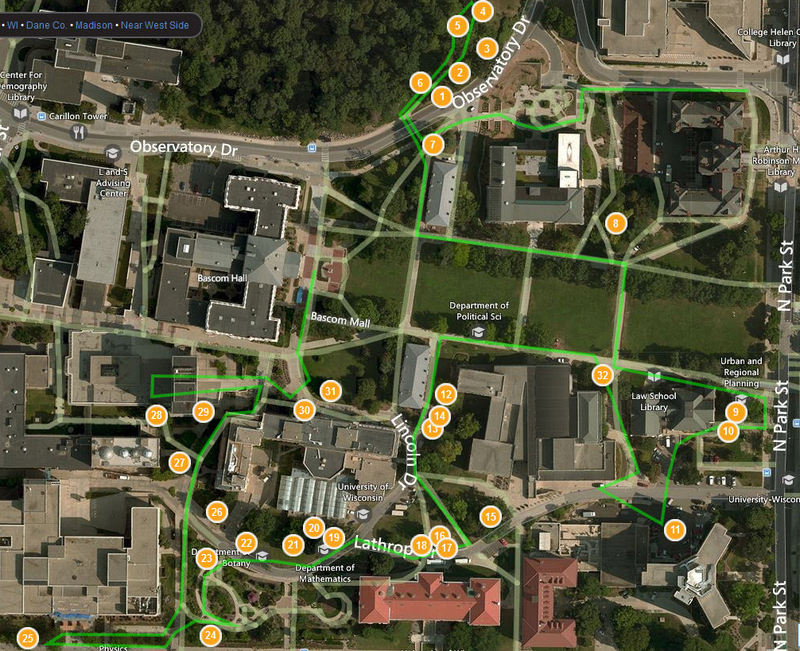 The first tree on my UW tree walk is not located on the map. I will let you try to find it. 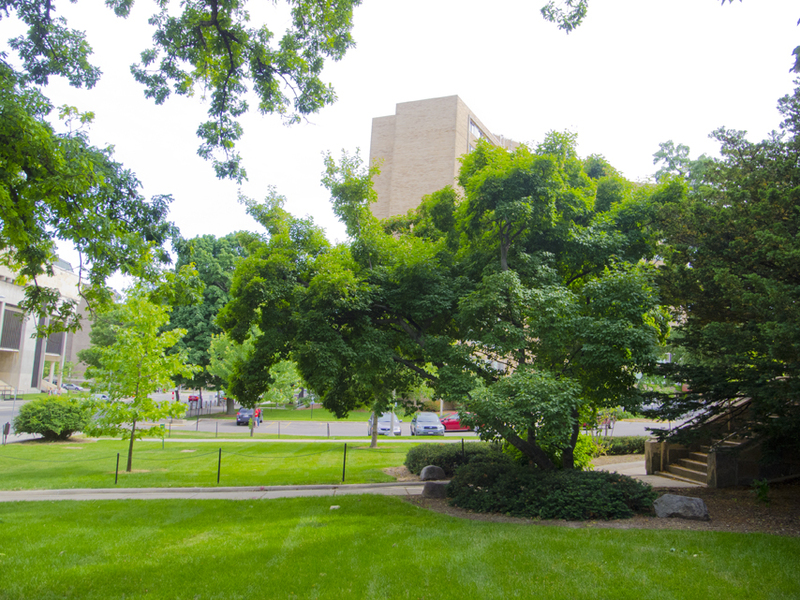 It is the Tree of Knowledge and is located near the base of Bascom Hill. This is the mark of The Riverside Press, commonly known as Houghton Mifflin. The words Tout Bien Ou Rien mean "all good or nothing". In other words, do something right or do not do it at all. An unidentified classical figure plays a musical instrument next to the rising sun alongside a river. The figure sits beneath the Tree of Knowledge. All of these symbols combine to express enlightenment and commitment. 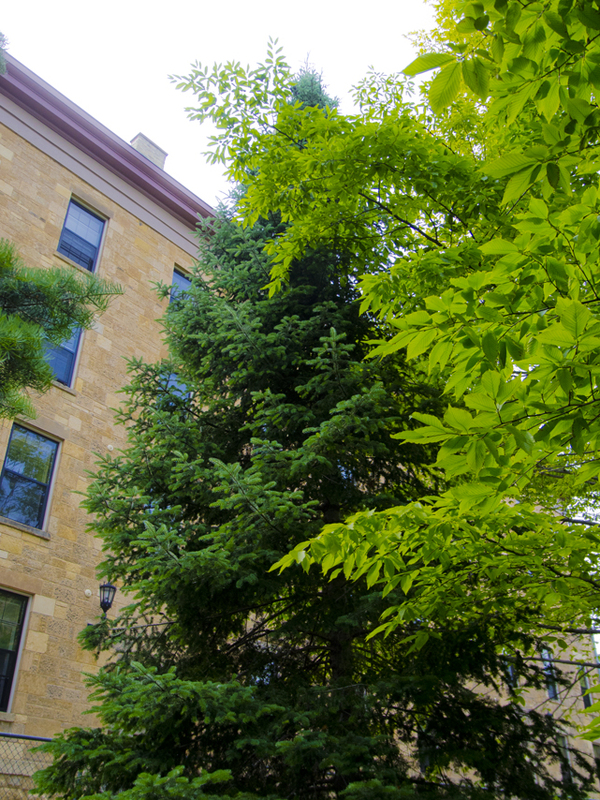 The famous black locust tree which inspired John Muir when he was a student at UW was taken down in the 1950's. In its place was planted this black locust at Muir Knoll. The black locust is a native of southeastern United States. Its bark and leaves are toxic, though its seed pods are edible raw or boiled. It's wood is strong and rot resistant making it prized for furniture making. It can grow on nutrient poor soils because it is a nitrogen fixer - meaning it brings nitrogen from the air and places it in the soil, effectively providing its own fertilizer. The regal presents an upward colmnar form which makes it ideal for street planting. 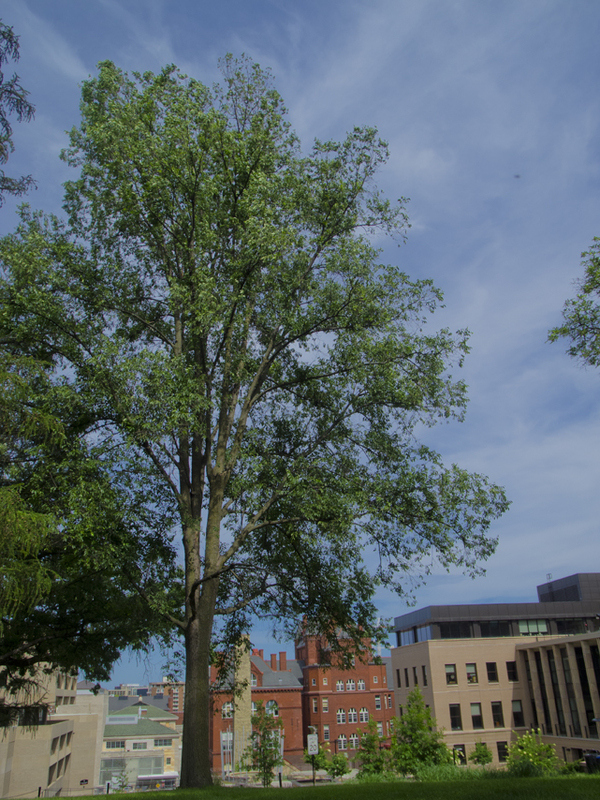 Unfortunately, elms are prone to Dutch Elm Disease. The roots of elms that are planted in rows (such as along streets) grow together and transfer the disease from one tree to the next. Elms have a symbiotic relationship with morel mushrooms; when the tree dies, the mushrooms 'sprout' in an attempt to reproduce or move to a new healthier location. This particular regal is resistant to the Dutch Elm disease. 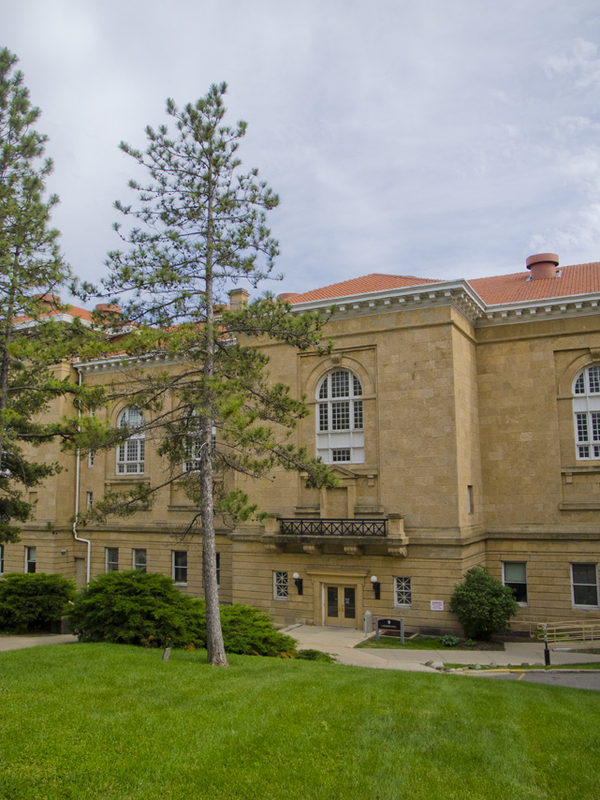 It is a resistant clone developed on the UW campus by Professors Smalley and Lester and was introduced in 1983. 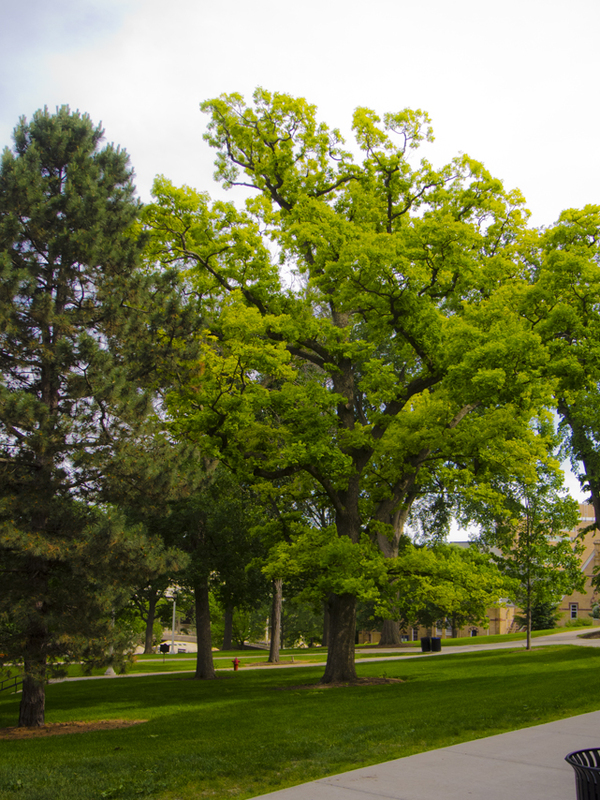 The sugar maple is the official State Tree of Wisconsin. It is also the national tree of Canada, its leaf appears on the Canadian flag. It is popular for its fall foliage and its sap can be extracted in spring and made into maple sugar and syrup. 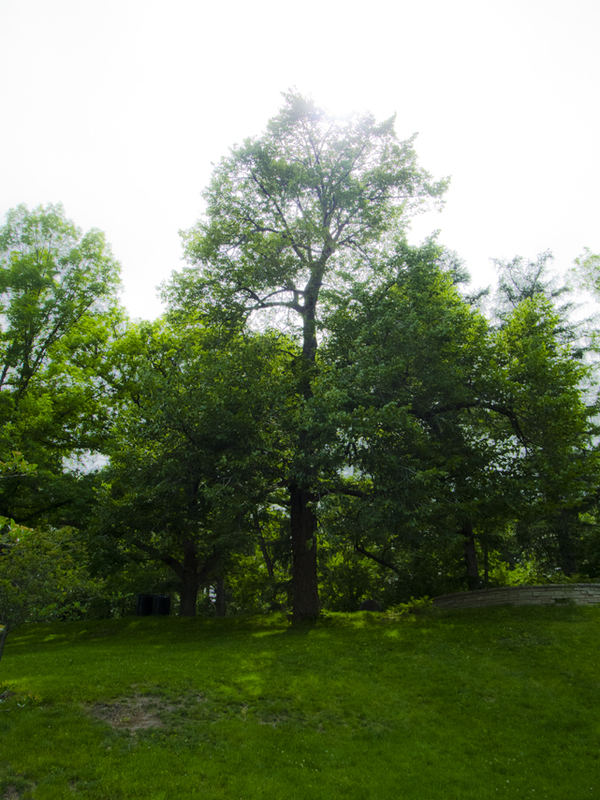 The American Linden is a popular shade tree, often planted in parks. It can reach 80 feet tall with a spread of 40 feet. It grows alongside maples, hemlock, and yellow birch. It is sometimes called the bee tree, because the honey produced by bees feeding from its aromatic flowers is considered among the best. Called basswood honey, it is described as delicate and mile, and has a warm herbal finish. American Indians produced rope from the inner bark of lindens. There are white oaks and red oaks. This is a white oak. These trees produce one of the most popular hardwoods for the production of furniture, flooring, and whiskey barrels. 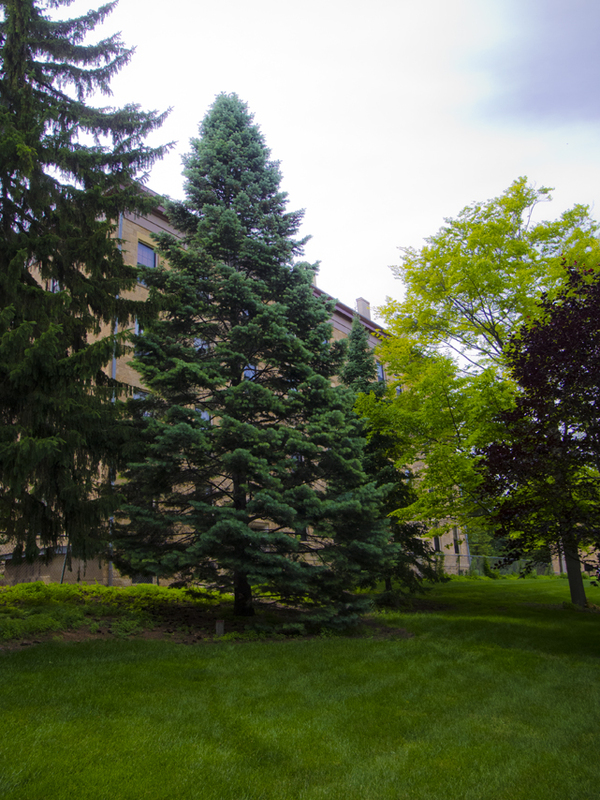 Of the pine family and native to Europe, this needle bearing tree is not an evergreen. It looses its needles in autumn. It is therefore a deciduous tree. The larch plays in important role in Lapp and Siberian mythology where it takes the place of the ash as the World Tree. Their shamans use larch wood to rim their ceremonial drums. The smoke from burning larch is said to ward off evil spirits. Larch may be used for protection and to induce visions. Larch is used for constructing outdoor furniture, posts, and shipbuilding. It's bark is used for tanning leather and turpentine is a by-product. This tree is native to China and Korea. It is often planted outside Buddhist temples. A profusion of white petals can create a white carpet beneath the tree. 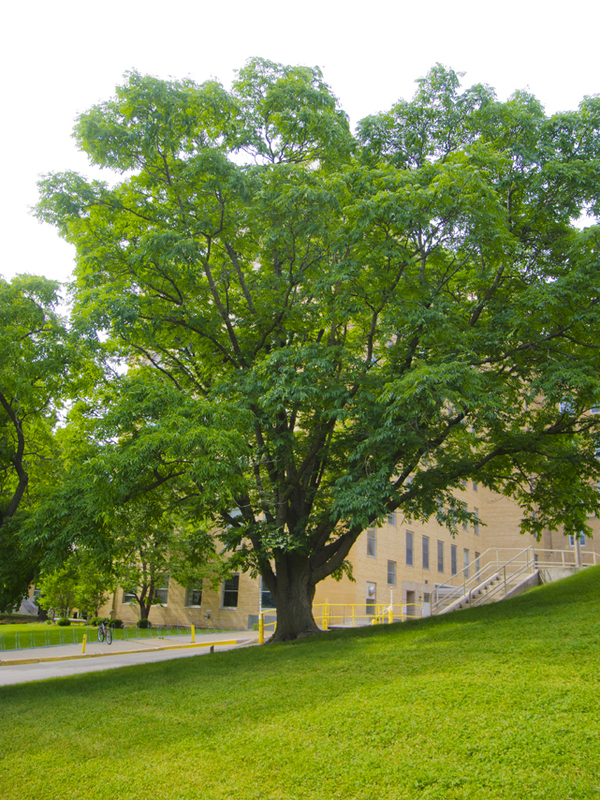 This tree is the largest of its kind growing in Wisconsin - making it an outright state champion tree. Ahh, hickory smoked ham! When burning green hickory wood, the smoke imparts a distinctive flavor to meats and cheese. Boiling crushed hickory nuts makes "hickory milk. American Indians used hickory milk for cooking corn cakes and hominy, or made a flour instead of milk for baking bread. Andrew Jackson was nic-named Old Hickory in honor or in jest of his toughness. The name does not refer to the tree as much as the toughness of accessing a hickory nut. In other words, Jackson was a hard nut to crack. The former president is buried beneath 6 shagbark hickories. 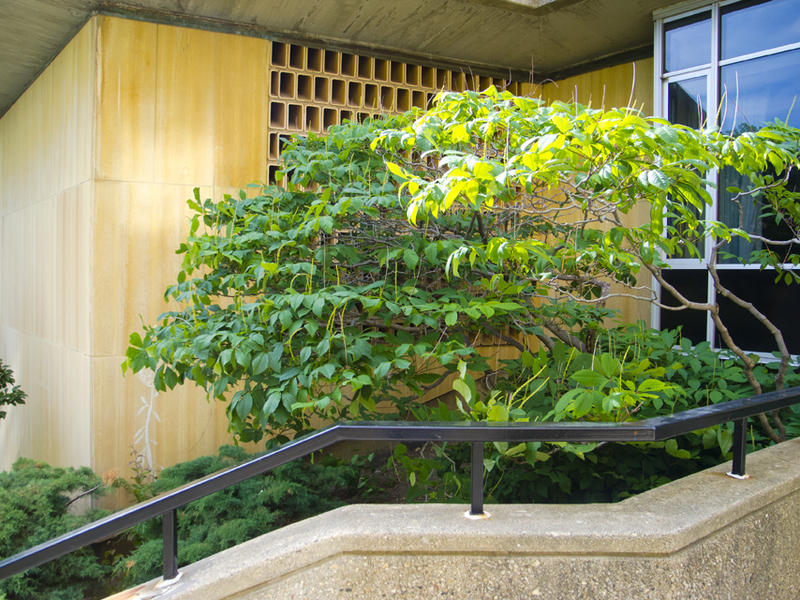 The amur maple and its cousin the tatarian are perhaps the most photogenic on campus. 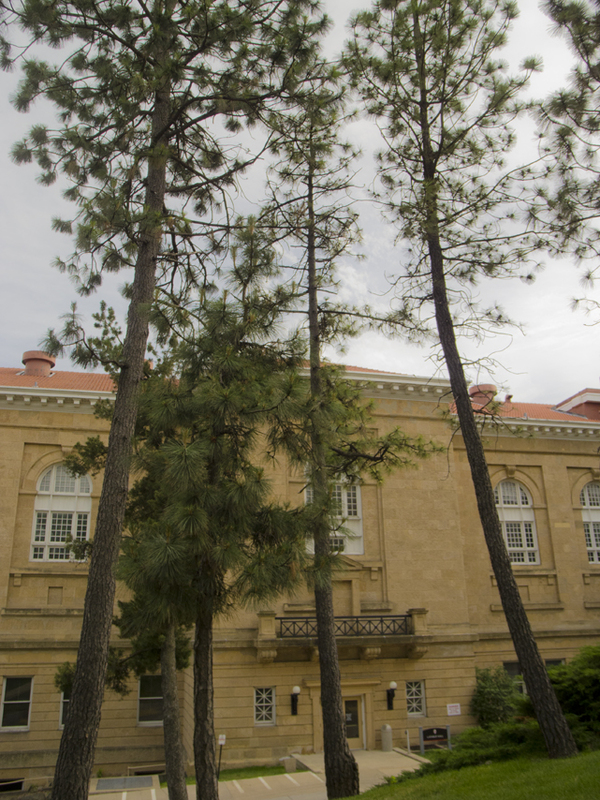 They can be planted close to buildings and in this case they are both planted near the entrance to Music Hall. This graceful and delicate tree provides a range of leaf colors: reddish purple as the leaves emerge, bluish green in the summer, and yellow to apricot in fall. Some say that the fall leaves provide a cinnamon/brown sugar fragrance. The smooth gray bark of the mature beech makes this an easily recognizable tree throughout its wide range across most of the country east of the Mississippi River. 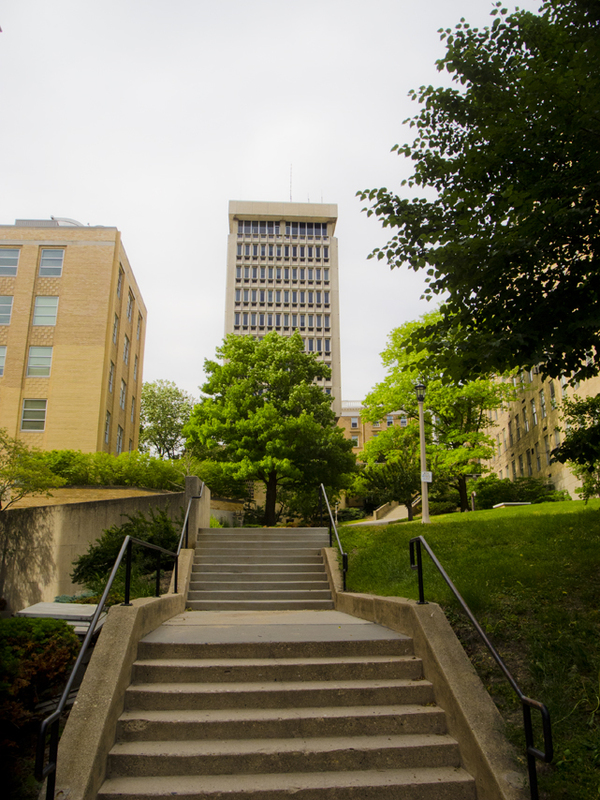 However, here in Madison we are the western edge of its native habitat and few beech trees are to be found in the area. 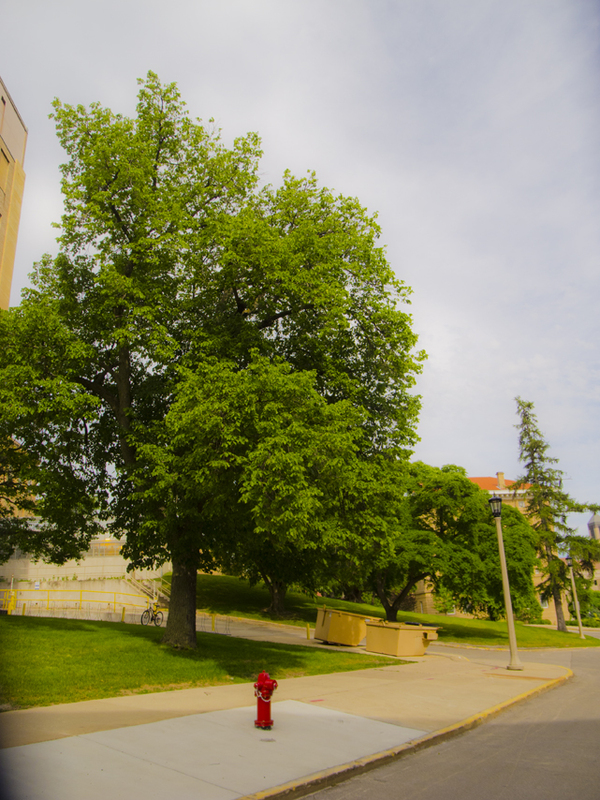 There are only two beech trees on campus. Another is nearby. Found on northern slopes the slender pyramid of the white fir reaches 100 to 180 feet. It is a climax species, meaning it will continue to grow and thrive - eventually crowding out other trees. If you are having trouble shaking shadow from you life - use white fir in a diffuser blend and it will energetically cleanse and protect your home and spirit.. Native to northern Wisconsin, the balsam fir does not perform well in the southern WI soils. It is a popular Christmas tree due to its aromatic needles. It is also known as the Canadian Fir. The Penobscot people smeared the resin of balsam fir onto burns, cuts and sores. Just another white oak. The alkaline soils on this hill caused chlorosis in this stand of trees. Aborists injected varieties of tree medicine into their trunks and the small bore holes are still able to be seen. Chlorosis can be spotted by trees which produce light colored or yellow leaves due to the failure of the tree to produce enough chlorophyll. You will typically find the ponderosa pine in the forest or on the back of a logging truck. This is the most important western North American pine for timber production. The name for the ponderosa pine is attributed to botanist David Douglas who in 1826 found the heavy timber to be ponderous. 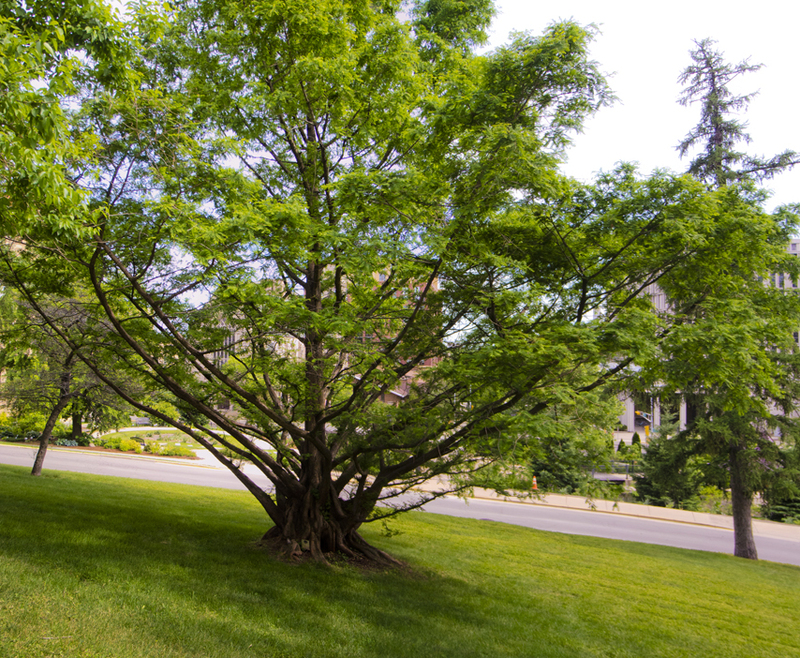 Native to the high elevations of the Rocky Mountains, this adaptable tree is suitable for growing in the Midwest. The scientific and common names for this tree refer to the flexible and tough stems of this tree which one can tie into knots without breaking. The red pine is a prominent forest tree in the Great Lakes region. It thrives on sandy or sterile soils and is frequently used in reforestation projects. The reddish color of the twigs and flaky bark provide this tough tree with its name. It is an important timber tree and can grow to three feet in diameter. 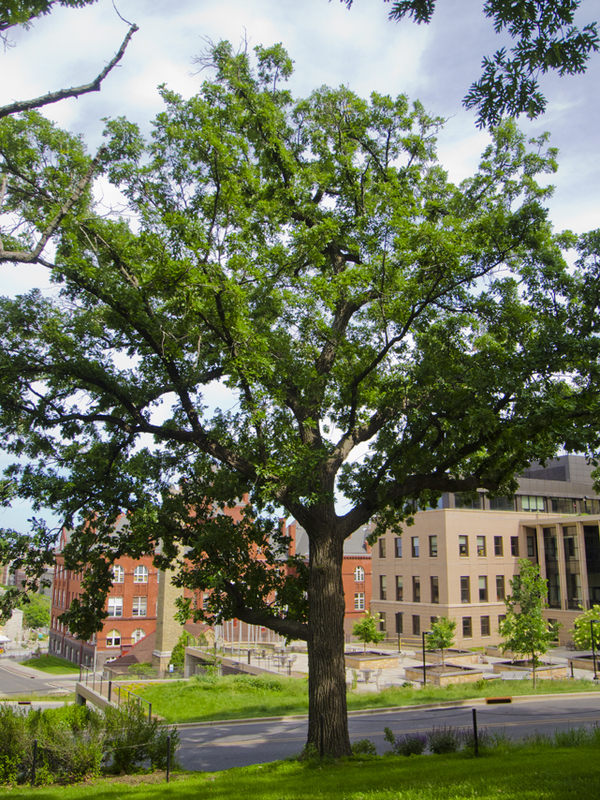 Known as the northern red oak or champion oak this tree is native to North America and Wisconsin. It is an important timber tree, but its grain is so open that smoke can be blown through it from end-grain to end-grain in a flat sawn board, so it is no suitable for outdoor uses. 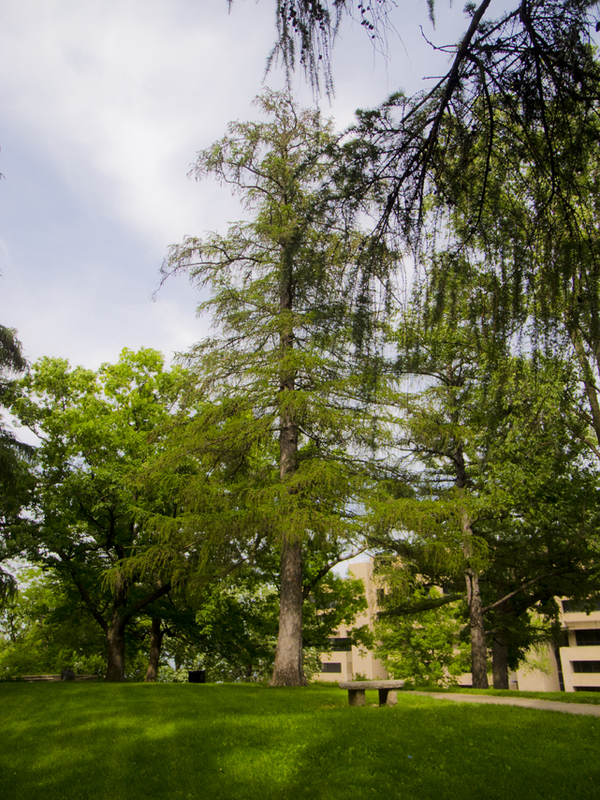 This tough tree can endure under a wide range of site conditions. It was used by FDR in the Great Plains Shelterbelt - a project to prevent soil erosion. Due to its thorns it is also used as cattle deterring hedges.The fruit of the osage orange is poisonous. Amur Corktree has earned its name from the spongy bounce of its furrowed bark. 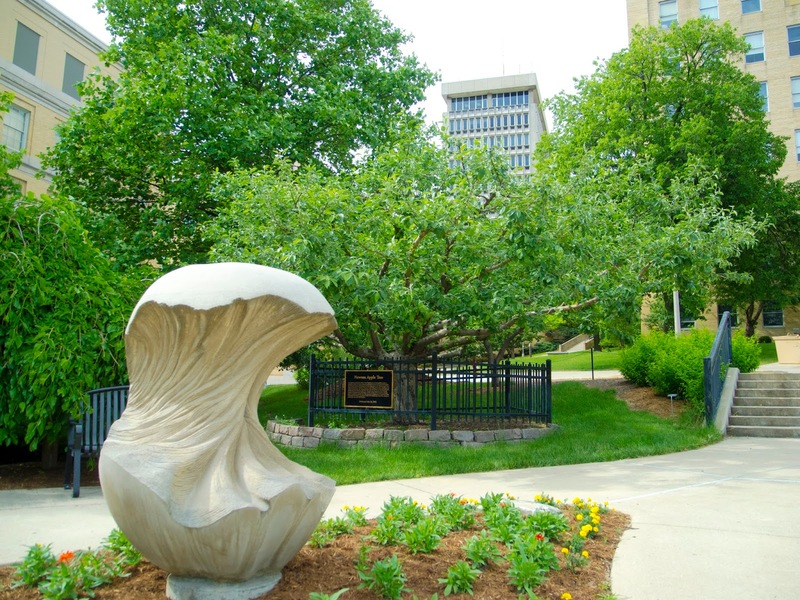 The Newton Apple tree was a gift in recognition of James Sensenbrenner, congressman of the WI 9th district and a graduate of UW Law. This tree is a direct descendant of the original tree said to have borne the fruit that inspired Sir Isaac Newton's Theory of Gravitational Forces. Grafted from the Newton Apple Tree that grows on the grounds of the National Institute of Standards and Technology, perhaps the fruit of this tree will inspire others to discover. 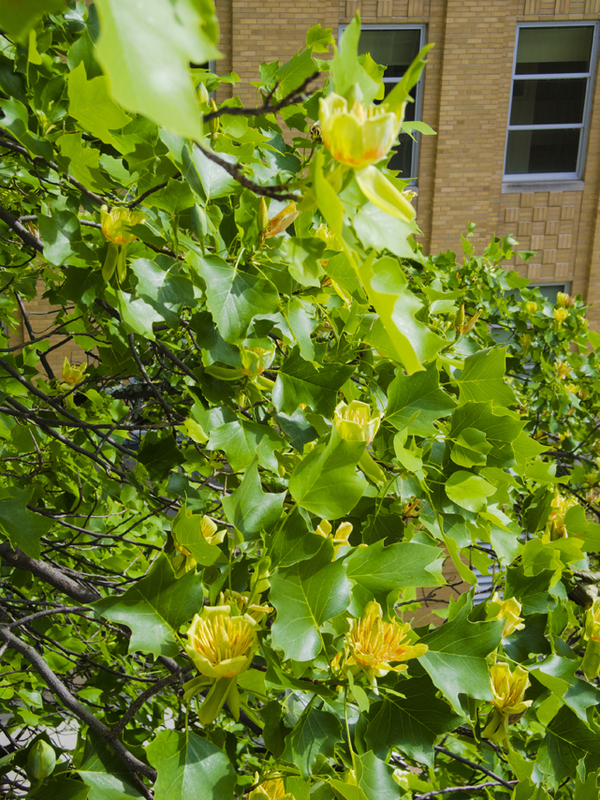 For centuries the ginkgo tree and leaves have been seen as a symbol of peace and hope. During the late 5th century A.D. a famous mural known as the Seven Worthies of the Bamboo Grove and Rong Qiqi was crafted on a sacred Chinese tomb. 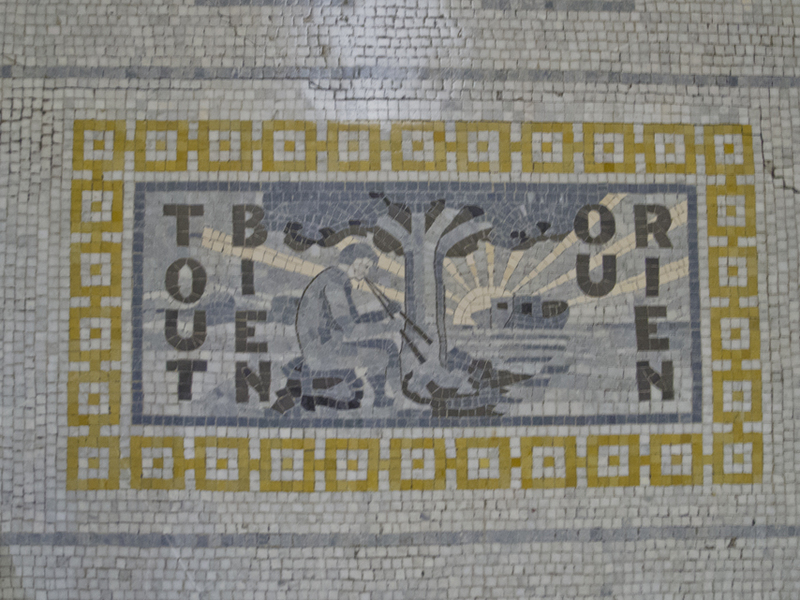 This mural has a clear illustration of ginkgo trees next to the graphics of the seven sages. The seven sages are said to be a scholarly clan that came together to stabilize China in the Edo period. The sages and ginkgos represent peace and movement towards freedom. The bark of this tree is soft and fuzzy like the velvet of new antlers on a male deer, hence the name staghorn. This tree grows rapidly in spreading colonies from root suckers. 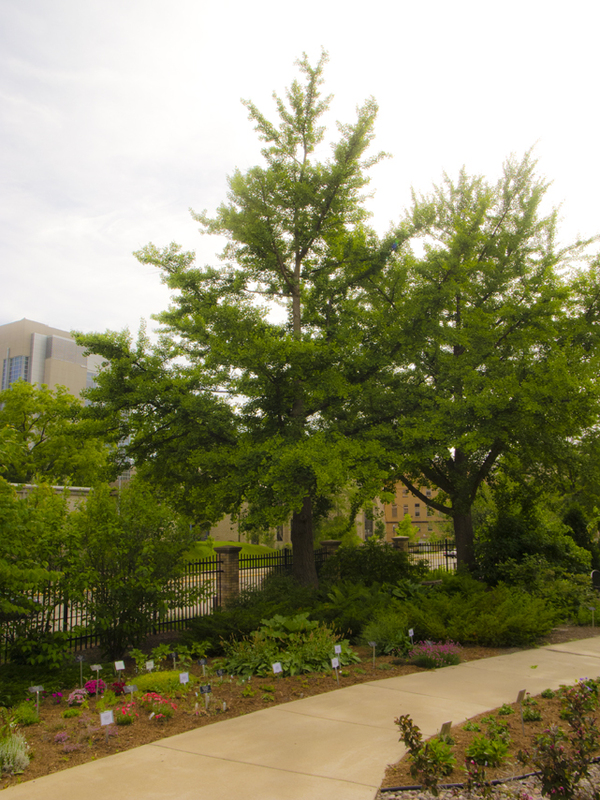 These trees are often seen growing along highways and in urban waste areas, thriving on dry sterile soil. Their berries persist into winter, feeding birds. 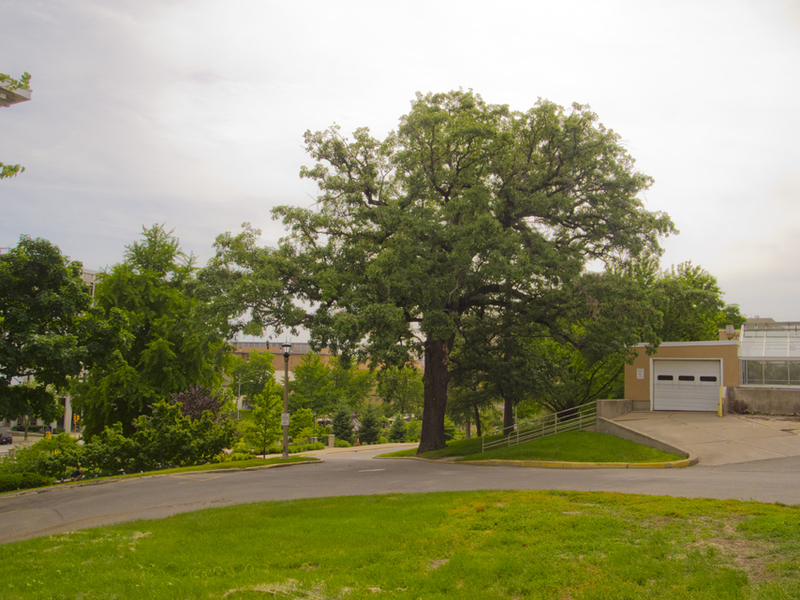 A relatively rapid growing deciduous tree, a mature red oak can create an impressive and massive presence in the forest or on a landscape. In the old-growth cove forests of southern Appalachia, the tuliptree grew in cathedral groves of straight trunked giants. 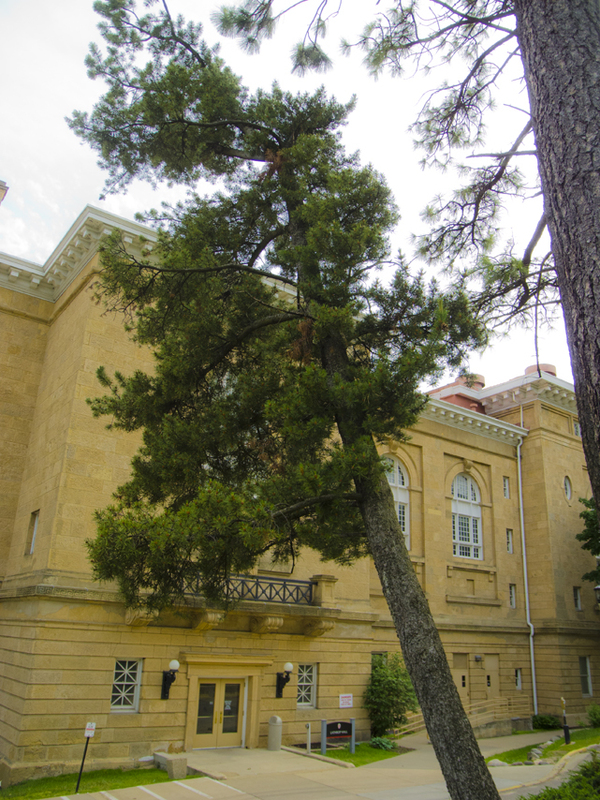 Specimens reaching 200 feet were rivaled only by eastern white pine. During the time of the American Revolution, Liberty trees were planted around the thirteen colonies. 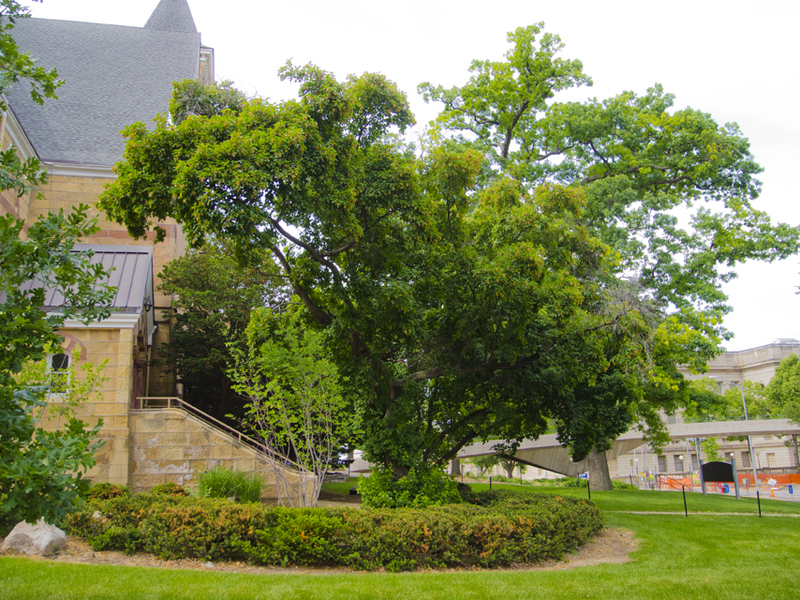 Many think that these Liberty Trees were only elm trees, but in fact Tulip Trees were planted as well. Whenever the British found these trees, they would be immediately chopped down because of what they stood for. An attractive ornamental shrub that does well in a shaded understory the bottelbrush buckeye is native to southeastern US. The large upright spikes of tiny white flowers remind some of the kitchen implement used to clean the inside surface of bottles. The suckering habit creates multi-stemmed clusters and will hold their leaves late into autumn, unlike other buckeyes. The most famous horse chestnut tree was probably in Amsterdam, outside of the house than Anne Frank and her family hid from the Nazis in. It was one of the few signs of nature visible to her during her two years of hiding. The tree was mentioned in her diary three times, and it often served to cheer her up. 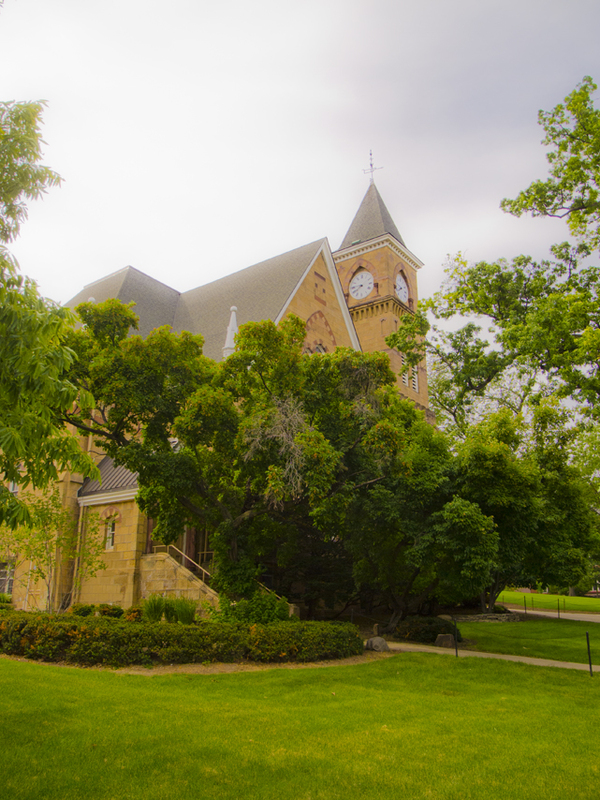 In August of 2010, the tree, estimated to be over 170 years old, was knocked over in a storm. 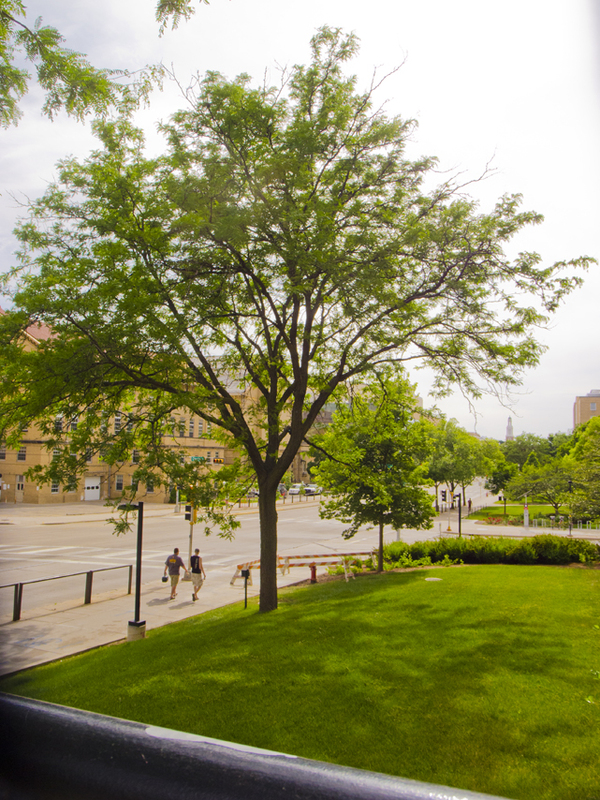 Bascom Hill is the University of Wisconsin's front yard, the symbolic core of the campus. 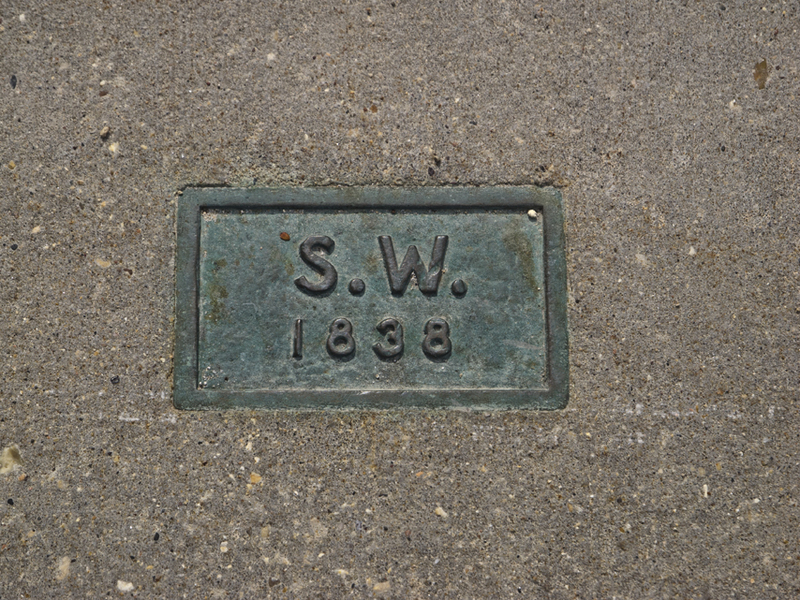 Bascom Mall is it's official name; it was designed in 1851. 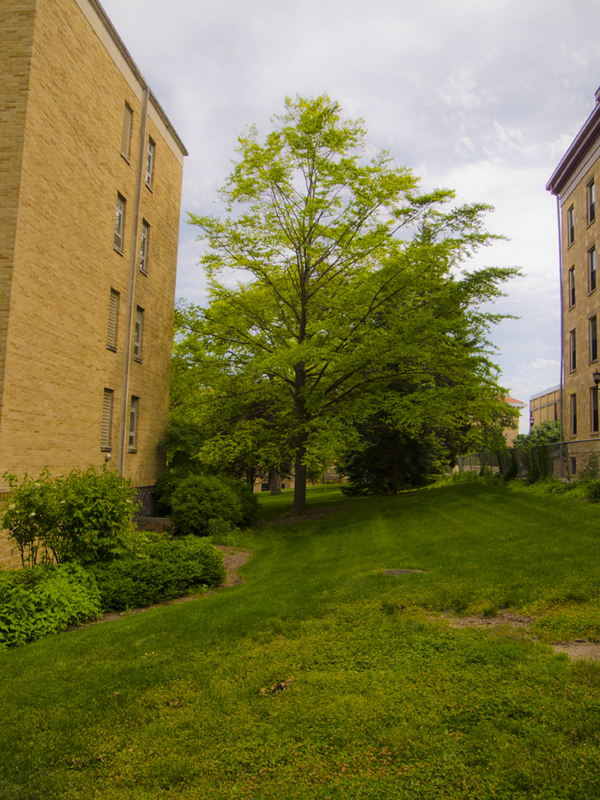 North, South, and Main (Bascom) Halls were the original three buildings on campus. In 1909 the Lincoln Terrace and Lincoln statue were placed. 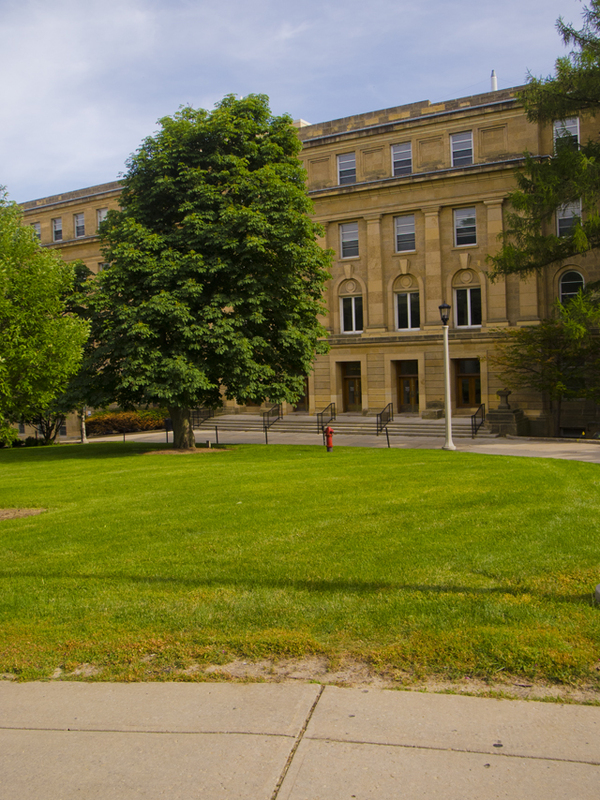 Old Abe keeps watch over the campus, State Street, and the State Capitol.